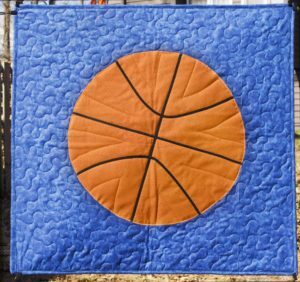 Home » Behind the Quilt » Introducing the Sportsball Quilt! 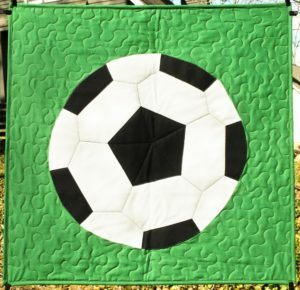 Between the two of us, Lynn is decidedly a bigger sports fan, so it is with sweet, sweet irony that I (yes, PAM) presents our latest pattern: SPORTSBALL! Yes, I made a sports thing! Lynn is an avid fan of the Tennessee Vols, both for college football and women’s basketball. You’d know that Lynn designed this quilt if all the colors in it were orange, but because they are not, hey, another clue that I designed it! And of course there’s an American football version because that is rather pervasive in the southern United States where we live, and frankly, in the a lot of colder parts of the country, too. The American football sample is in the colors of the Green Bay Packers. 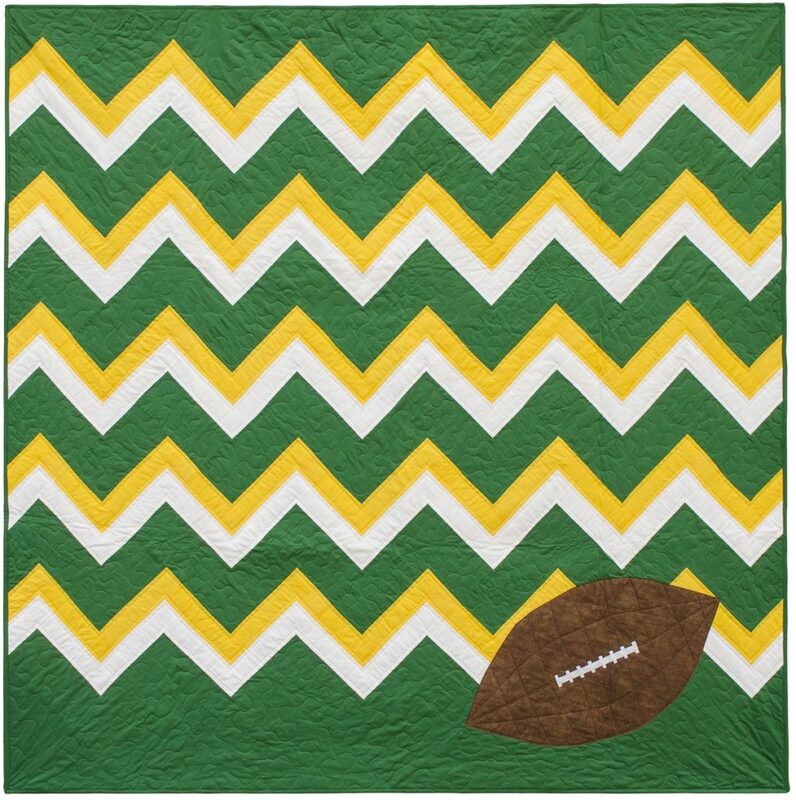 Fun story: I picked the Packers’ colors because I figured in a Venn diagram of quilters and football fans, there was a decent overlap of both in the state of Wisconsin. I did not realize, however, that just about the time I would be making this sample that my husband’s favorite team (the Atlanta Falcons) were playing the Packers in a playoff game. I opted not to make it in the Falcons team colors (red and black) because those are also the team colors for my college rival football team and if that’s not a reason to not let sports influence important life decisions like fabric choices, I don’t know what is. Anyway, there are also instructions to make your own version of football as it’s known in the rest of the world (or soccer in the United States) and even basketball (because Lynn made me!). Do not care about sports! Also have a lot of jelly rolls! The best part of ALL of these quilts? You aren’t sewing on the bias. 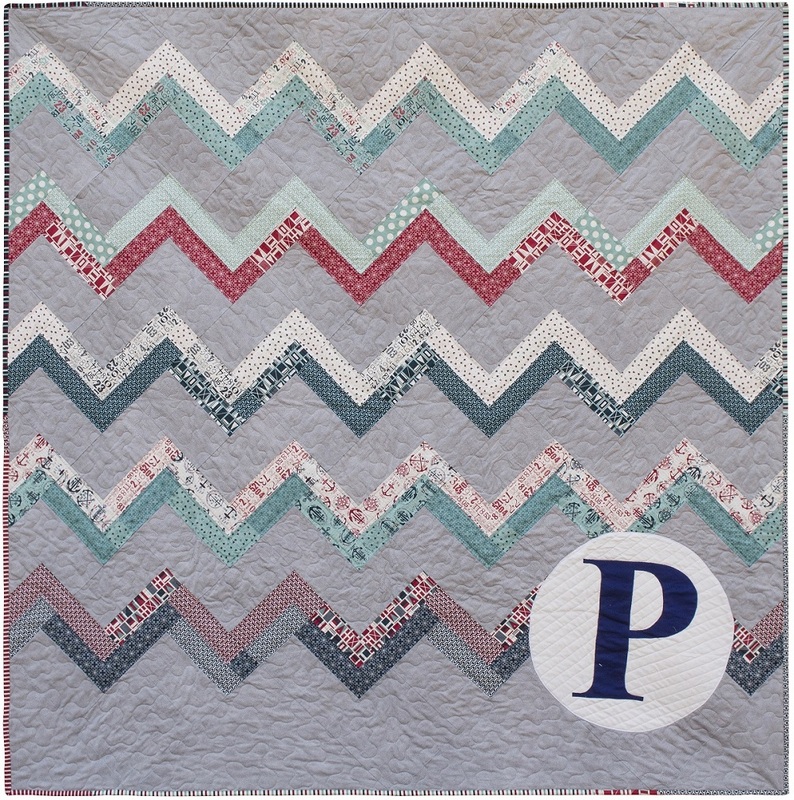 The chevrons in this quilt are made out of two blocks and not weird bias piecing. Bliss. 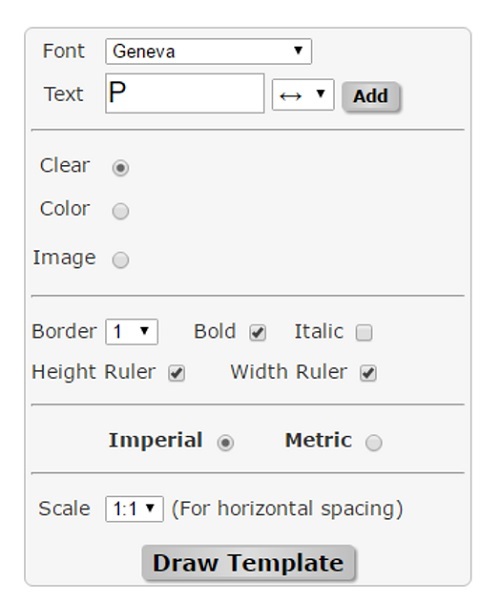 Go to the website BlockLayer.com in their Printable Text Templates page. Scroll down and click on “Create PDF”. 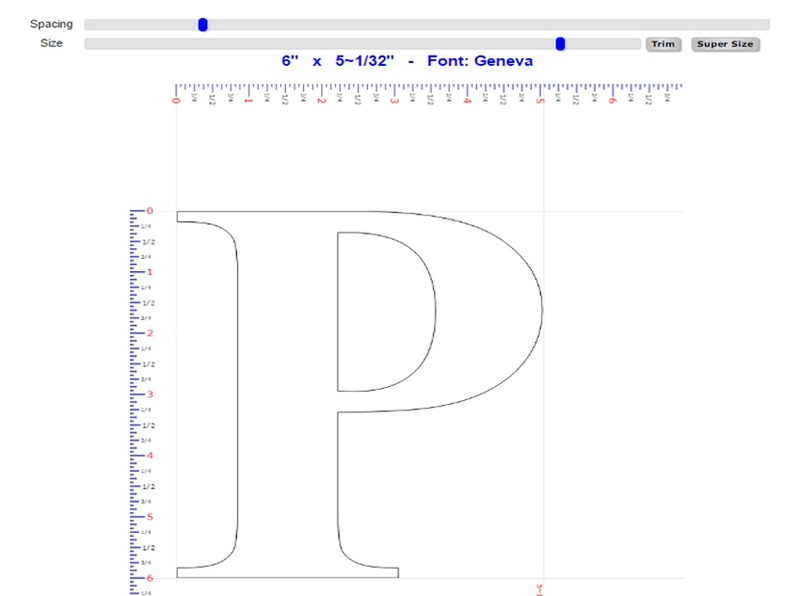 This will create a PDF of your 6″ letter. Print that on your home printer at 200% size (so the letter ends up at 12″). This will print on multiple sheets of paper you can tape together to make your own pattern. Remember to trace the letter on your fusible web backwards so it’s comes out the right way! 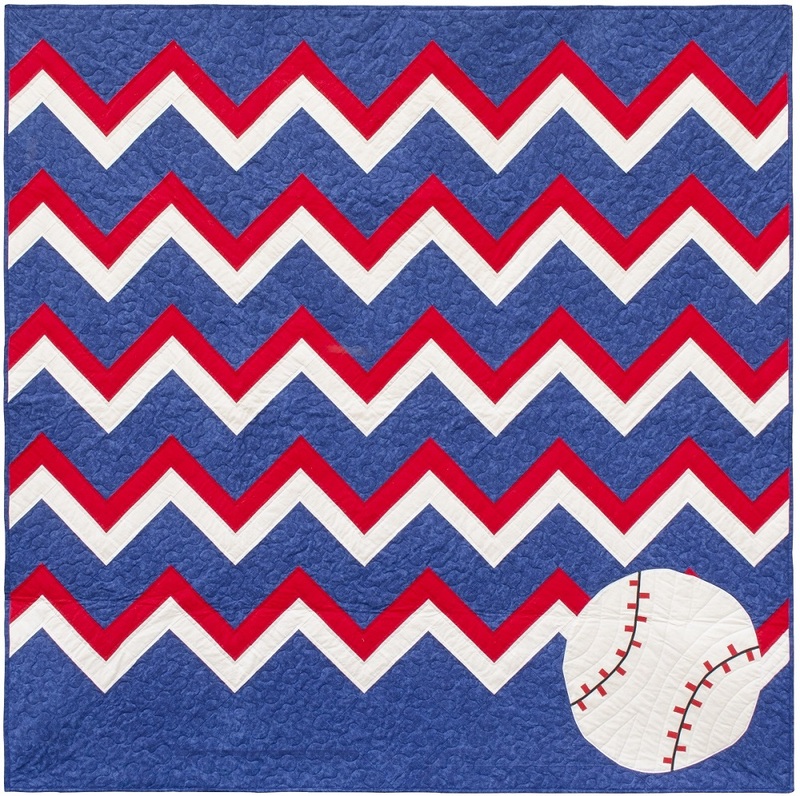 Go get the digital pattern from our shop, and stay tuned for more coverage of the Sportsball quilt on Friday’s episode!